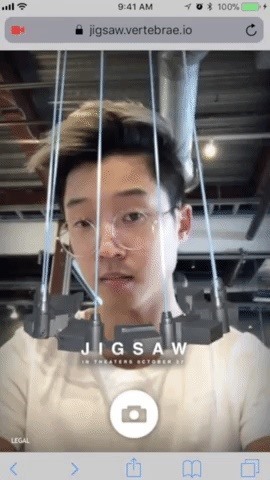 Using Vertebrae's recently-launched AR mobile web ad platform, the ads for Jigsaw will be served as display ads to any one of hundreds of websites accessed through Chrome and Safari mobile browsers. After opting into the experience and allowing camera access, the ad scans for a face and then traps the viewer in a virtual mask, not unlike those deployed by the titular villain. As one would expect, users can capture the augmented image for their own nefarious purposes. Those who opt to share the experience via Twitter receive a $5 discount code to purchase a pass to the movie through Atom, an online ticket vendor serving nine theater chains, including AMC, Regal, and Landmark. "Now is the time for mobile AR, and immersive media more broadly, and it will be exciting to see which companies take advantage," said Vince Cacace, founder and CEO of Vertebrae, in a statement provided to Next Reality. "Advertisers will have a field day due to the personalized experiences consumers can have with products." The Jigsaw ad is built with Vertebrae's Dynamic Experience Mask template, one of five that the company offers. Other templates include Virtual Try-on (which Ray Ban uses), Interactive 3D Objects, Portals, Interior World View, and photo filters. We see so much room for growth with the limitless scale the mobile Web has to offer, and we are creating the AR advertising templates through which the industry will take shape. As we execute more campaigns in verticals like automotive, retail and more, we'll have an ever-expanding rolodex of mobile Web AR templates for advertisers to choose from. According to a spokesperson, the ads are targeted to the movie's "most likely fans" based on location data. The campaign is on-going, with no set end date. Keep an eye out for the ads in your mobile browser to get that discounted ticket. Lionsgate isn't putting all its chips on Vertebrae and its mobile web AR ads, though. The studio also bought a SnapChat photo filter, according to a report by Ad Age. It would appear that campaign has run its course, as I did not see a filter (unless I'm outside their target location or age demographic). 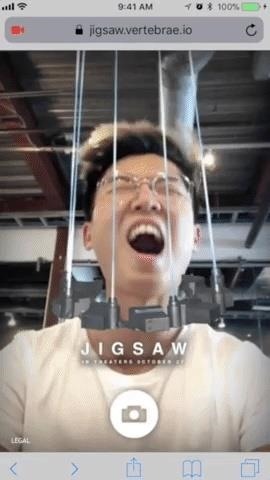 In addition, the studio partnered with Unity to create a VR experience called Jigsaw Virtual Room. Through Nov. 6, the experience can be launched via ads appearing in the Nanite Fulcum app for Oculus Rift and Gear VR as well as a featured panel ad in the Samsung Internet app for Gear VR. In the VR experience, viewers are challenged with solving one of the movie's infamous murder puzzles. Because nothing makes me want to see a movie more than the experience of being a victim of a deranged serial killer.